How does looking at prisons’ laundry receipts or funeral documents help finding those who have gone missing? On 30 August 2016, the ICRC hosted a panel on “Clarifying the fate of missing persons: challenges in international humanitarian law and international human rights law” to commemorate the International Day of the Disappeared. Legal and forensic experts clarified how international humanitarian law and human rights address the problem of the ‘Missing’, and explored recent initiatives to locate victims of disappearance, identify human remains and assist families of missing persons. With these words, spoken on the occasion of the International Day of the Disappeared on 30 August, ICRC President Peter Maurer sought to draw attention to one of the most complex, challenging yet under-reported humanitarian problems in the world today. Hundreds of thousands of people are currently missing in contexts as varied as Southern Caucasus, Papua New Guinea, Colombia, Peru, Syria and Ukraine. They may be those who have been lost at sea, or obliterated by armed conflict, violence and disaster, and are never to be found again. They may be casualties whose remains cannot or will not be identified by competent authorities. They may be those who journey away from persecution or misery and have no way of informing their loved ones about where they are and how they are faring – save even reassuring them by letting them know they still live. When people affected by armed conflict, violence, disaster or migration go missing, their families become victims too: not only do they live in the agony of not knowing whether to mourn or hope; not only are they refused the comfort of closure and the dignity of funeral rites, but they themselves often risk their lives in a quest for answers. To get to know how to improve our response in clarifying the fate and whereabouts of the missing, and to better understand the humanitarian significance of the families ‘right to know’ about their loved ones, the ICRC convened a panel of legal and forensic experts at the Humanitarium in Geneva. The panellists covered the obligations to prevent people from going missing, before delving into initiatives aimed at clarifying the fate those who did. How does the law address the problem of the ‘Missing’? While there is no single legal instrument intended at addressing comprehensively the humanitarian problem of the ‘Missing’, both international humanitarian law (IHL) and international human rights law (IHRL), as well as national law to varying extents, contain obligations concerning the clarification of the fate and whereabouts of those who have gone missing and the protection of the rights of their families. A wide array of human rights may be violated when someone goes missing, including: the right to security and liberty, the right to life, the protection from torture and other inhumane treatment, including solitary confinement. Violations may in certain cases extend to the families of victims: for example, human rights monitoring bodies have established that forced disappearance also constitutes inhumane treatment of the families themselves. The breadth of those violations thus require a multi-right approach, which may draw on a variety of instruments such as the 1966 International Covenant on Civil and Political Rights, the 1984 Convention against torture, the 1951 Refugee Convention, as well as regional instruments such as the 1969 American Convention on Human rights – and the list goes on. Enforced disappearance in one of the chief factors by which people go missing. This happens when a person is secretly abducted and detained, and when the abductor refuses to disclose the motive of detention and to reveal the fate and whereabouts of the victim. “Under customary IHL, we found a rule that clearly say that enforced disappearance is prohibited,” said Ximena Londoño, legal advisor at the ICRC. This prohibition also exists under IHRL and is specifically enshrined in the 2010 International Convention for the Protection of All Persons from Enforced Disappearance. As mentioned by Lisa Ott, co-head of the “Dealing with the past” program at swisspeace, the Convention not only prohibits States from committing enforced disappearance, but also gives them a duty to take comprehensive legal and administrative measures to guarantee this does not happen. “It means [States] have to codify in their national criminal law that enforced disappearance is an offence; they have an obligation to have up to date registers of detention centres; that the manner of releasing a prisoner has to be transparent, and the list is much longer,” she says. States are also required to ensure disappearance does not happen. As Londoño highlighted, one of the main obligations found under IHL regarding the missing is to prevent people from disappearing. This entails ensuring the delivery of identity documents and means of identification for armed and security forces, in addition to holding a register of all people at risk of disappearing (ex. the wounded and sick, elders, disabled persons and those deprived of liberty). In terms of prevention, the Geneva conventions comprise provisions on the establishment of national information bureau at the national level. Also of paramount importance is the delivery of proper death certificates once human remains have been identified and handled properly. There are thousands stories of families who don’t give up hope that they will find out what happened to their loved ones. This is the story of Naim and his family, whose two brothers remain missing during the conflict in Kosovo in 1999. Another crucial State obligation under IHL is to clarify the fate and whereabouts of those who have gone missing. This means that parties must take all feasible measures to account for persons reported missing and to provide any information they have on their fate. They must also search for, collect and evacuate the dead, gather information prior to the disposal of remains, and have the obligation to mark the location of grave sites, all of which in view of identifying human remains and treat them with dignity. Failure to do so may lead to an increase in the number of persons unaccounted for and deprive families of closure, whereas the appropriate collection and identification of human remains enables culturally and religiously appropriate funeral rites, and ultimately allow families to overcome the past. Under IHRL, the International Convention for the Protection of All Persons from Enforced Disappearance is of particular significance, as it enshrines the families’ right to know, that is: the right to obtain information about the time and place of places of detention, on the authorities who requested the detention of a family member, about the transfer of a person from one place to the other, among a whole catalog of other rights. The convention also establishes a duty to search for the disappeared, for example through the creation of commissions – for instance of truth commissions, which address the ‘right to know’ of society in broader sense. While international law clearly establishes the right to know and the prohibition of forced disappearance, a number of challenges remain. First, in the absence of a legal definition of ‘missing persons’ in international law, how to define it at the national level? The ICRC recommends the following parameters: 1. Basing the definition on the uncertainty of the fate of the person to his/her relatives. 2. The person has been reported missing on the basis of reliable information, due to armed conflict but also other situations of violence, natural and man-made disaster, as well as migration. 3. The definition should be as broad as possible so that certain categories of missing persons do not fall outside the scope of the law. Relatives like this woman have to initiate procedures to recognize the presumption of death because they do not have a choice before the law with regards to the recognition of the absence of the sought person. This legal gap causes a wide array of problems related to property and inheritance rights, pension rights, the right to enter a new union, parental rights etc. The Lebanese civil war ended more than 25 years ago. 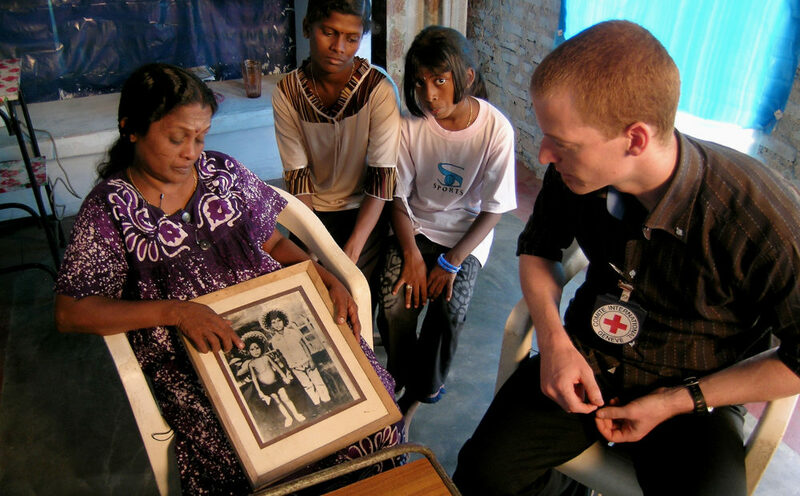 But for many families whose loved ones are still missing, the war is far from over. A third challenge is related to post-conflict and transitional justice processes. The obligations under IHL pertaining to the missing are obligations that continue to apply even if an armed conflict has ended. This is particular relevant to bear in mind for instance in any post conflict or transitional justice process. Therefore, every process should put in place a series of measures that will allow for the clarification of the fate and whereabouts of those who went missing during the conflict, and address the various needs of the families, be they material, financial, psychological or legal. These structures and procedures should be equipped with the proper capacities in terms of information management and processing of information, the proper management of human remains and the support for the families of persons unaccounted for. Overall, the core of the matter lies in ensuring full compliance with IHL and IHRL obligations at national level. “At the end of the day, the situation of missing persons needs to be prevented, addressed and resolved,” Londoño concluded. The ICRC panel on the Missing showcased innovative projects, the first aimed at identifying human remains – in particular those who drowned crossing the Mediterranean Sea – and the other at locating victims of disappearance. Leading the former initiative is Professor Cristina Cattaneo, Head of the Laboratory of Forensic Anthropology and Odontology at the University of Milan, and also member of the ICRC’s Forensic Advisory Board. As a premise for action, the professor considers that the identification of human remains is fundamental for the serenity and piece of mind of families – a fact now corroborated by psychiatric studies that consider such lack of closure a health problem. Recently the International Organization for Migration (IOM) estimated that (.pdf) about 40,000 dead bodies are buried in majority across the borders of southern Europe. These numbers are mostly unidentified dead and, to Cattaneo, IOM’s figures are probably an underestimation. When a jet plane crashes, “there is a huge mobilisation of forensic scientists. The system immediately shows its interest in identifying the dead. Why is this not happening for these tens of thousands crossing the sea?” she asks. Cattaneo and her lab conducted a pilot experiment following the Lampedusa shipwrecks of the 3rd and 11th October 2013, which claimed around 400 lives, and another on 18 April 2015 which caused up to 800 casualties before the boat was brought to port in Catania by the Italian navy very recently. In the former case in particular, the team strove to collect post mortem data homogeneously, and sent out calls to embassies in Italy, NGOs and various European countries, who would ask relatives of victims to bring forth ante mortem information (i.e. information on the missing person before death) to Rome and Milano. The use of archives is also crucial for finding missing persons and supporting legal mechanisms that aim at prohibiting disappearance and bringing forward the families’ right to know. Research conducted at swisspeace’s “Dealing with the past” program recognized the importance of using sources as varied as police record and detention records, prisons’ laundry receipts (which may hint at more detainees than those declared by the prison authorities), funeral documents (which may reveal the location of mass graves which are not marked in official books), among many others. Even if I find a skeleton, I don’t care: I just want my son back. I am living between 2 realities: knowing your loved one will probably never return but hoping all the time that they will. Our hopes won’t vanish until they or something belonging to them is found dead or alive, we believe the truth will come out.